I recently watched The King’s Speech for the second time, and as is often the case when we “resee” something, I came away with a very different perspective. This time I saw a story beneath the story. 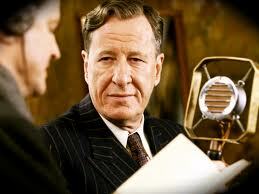 I was intrigued by how Lionel Logue was modeled after a modern-day coach whose practice rests on the tenets of Co-Active Coaching, Positive Psychology and Appreciative Inquiry. Trust and Equality In the case of Lionel and Bertie, the power gap favoured Bertie, and he needed to remove himself from his lofty heights and allow himself to build trust with a social inferior. A lifetime surrounded by obsequious bowing and scraping had left Bertie isolated in loneliness and despair in dealing with the effects of his speech impediment. Logue extended the hand of comradeship, and established equality through addressing His Royal Highness The Duke of York, by the nickname bestowed on him by his family, a deliberate breach of etiquette of epic proportions. More often the perceived power gap is in the opposite direction. The coach may be seen as the all-knowing expert, but nothing could be farther from the truth. The relationship between coach and client is one of equals in all respects. One of the cornerstones of the Co-Active Coaching model is that the client is naturally creative resourceful and whole. The coach serves as a mirror, to reflect back to the client and invite them to take a different perspective on what is reflected. The coach asks questions, so the client can hear what they think, and recognize what they know. In so doing, mental and emotional space is established for the client to examine their own thoughts, feelings and perceptions, and to permit an active choice regarding the desirability of any modification. This offering of observation and experience is done on the basis one human being to another, not an “expert” to the “lowly”. An Asset or Strengths-based Approach Logue didn’t fix a problem. He demonstrated circumstances under which Bertie was already able to speak perfectly. He drew out what was already there. An asset rather than deficit focus. Appreciative Inquiry leads coaches to ask questions such as, Under what circumstances are you succeeding? What is different about those times? What is working? How might you do more of that? Coaches do not see the client as a problem to be “fixed”. They see the client as the possessor of myriad talents and strengths, and it is their privilege to offer guidance in shining light on those so they can be embraced directly and joyfully. The coach helps the client develop an accurate positive profile. It’s fascinating how often we have contempt for our strengths. “Everyone does that” we sniff. Or we have “strengths envy”. We discount our strengths, and long for the ones others display. At the same time, a strength-based approach doesn’t ignore weaknesses. Logue unflinchingly pointed out Bertie’s bad temper, in the same calm, matter-of-fact way he inquired about circumstances that might have contributed to Bertie’s stammering, such as being forced to write with his right hand while being naturally left-handed, and being abused and starved by his nanny. By drawing facts and consequences into the light for examination and possible correction or redirection, a coach assists the client change circumstances, redirect emphasis, and take on different perspectives, with humour, compassion, and realism. Offering Experience and Knowledge Through Logue’s experience, he knew that people who stammered frequently did not do so when they couldn’t hear themselves speak. When Bertie donned headphones playing vigorous classical music, Logue recorded him reading a passage from Shakespeare. The breakthrough came when Bertie listened to this recording at a later time. He had a new view of himself – a different perspective. He had experienced success, and his “impediment” was downgraded to a “mechanical difficulty”. The monster was assuming a much smaller role, and Bertie with all his strengths was emerging. What holds people back from figuring this out on their own, since the strengths and capabilities are already there? Sometimes it’s a lack of information connecting the dots, or being stuck in a perspective that doesn’t allow for any other possibilities. It’s x or y, we state flatly, presenting a sucker’s choice. Partly it is due to the way our brains are constructed. Thoughts and memory work by linking to what we already know. It’s much more difficult to envision something entirely new than to build on past experience. Coaches lend their experience, and that of others, to form a tentative new hook for the client to use, like a new point of attachment on the cliff face when mountain climbing. Fear can also play a role in keeping people stuck, along with the weight of previous failed attempts. In Bertie’s case, well-meaning and useless interventions to correct his speech, on the authority of prominent physicians of the day, such as the “marbles in the mouth” cure, being urged to “just spit it out”, and ‘take your time”, followed by immediate exhortations to hurry up. Logue saw the person, the whole person, not the speech impediment. He could see the soul underneath struggling for expression and acceptance. The title and grandeur didn’t matter; it was the humanity of Bertie that connected to the humanity in Logue. That connection – human to human – is the best of coaching. When we can touch the client’s most vulnerable, tender thoughts and aspirations and together, gently breathe them into life.